The Condor 90 CNC, and its three derivatives, the LR for cutting steels, the MR, for copper bronze and brass and the HR for, aluminium, comprise a range of electro-pneumatic automatic sawing machines. Available in Australia from Power Machinery , the electro-pneumatic automatic sawing machines are designed to co-operate with the CB 6000 loading magazine for higher levels of production. With a minimum rest piece of 70mm and a 1000mm feeder system using a screw/nut system with re-circulating balls and stepper motor, the Condor 90 CNC uses a multi-microprocessor to execute up to 32 different 0° cuts of different lengths and quantities. In addition to this, an automatic and adaptive shearing stress control system with servo-valve is directly mounted on the cylinder. This regulates the feed according to cutting load. A feeder carriage, which has a sideways movement, also feeds in deformed bars. 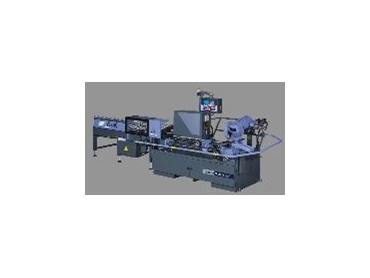 This machine is specifically designed to accept the optional magazine loading system.